Car and racing enthusiasts especially have a lot to look forward to this weekend in Hendricks County, but there is so much more going on. Labor Day Weekend may arguably be the busiest weekend in Hendricks County all year, so let&apos;s get to it. The biggest visitor event this county sees every year occurs this weekend as Lucas Oil Raceway in Brownsburg becomes the epicenter for all things drag racing as it hosts the 62nd Annual Chevrolet Performance U.S. Nationals. The racing action begins Friday and the event runs through Monday. Check out Eric Ivie&apos;s recent blog for more information. With so many race fans in town, Don Schumacher Racing will host a free indoor car show and open house this Friday from 10 a.m.-3 p.m. in its Brownsburg race shop, 1681 E. Northfield Drive. Pennzoil will provide T-shirts to the first 500 guests. All eight DSR drivers will be joined by owner Don Schumacher for an hour-long autograph session beginning at 1 p.m. Guests will also have an opportunity to tour the shop. A silent auction with live and online participation will benefit Riley Hospital for Children. More information about this event can be found here. Head over to Danville&apos;s Courthouse Square from 5-9 p.m. Friday night for the First Friday Cruise-In where you can see some beautiful classic cars. This free event takes place every first Friday May through October. After you&apos;re done admiring the cars, grab some dinner with your family at the Mayberry Cafe, Frank&apos;s Place, or Diesel&apos;s Sports Grille. Hendricks County Parks & Recreation regularly puts on fantastic educational programs for children and the whole family. This Saturday, a park naturalist will teach about ants during a free one-hour program at 11 a.m. at Sodalis Nature Park in Plainfield. Also Saturday, a naturalist will teach about fall bird migration at 2 p.m. at McCloud Nature Park in North Salem. Registration is not required for either of these events. More information can be found here. 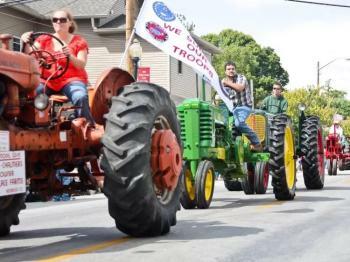 This small-town, three-day gem has lots of fun activities for the entire family to enjoy including a parade, horse pull, bike ride, bed races and more. Stephanie Porter recently blogged about this awesome festival that you won&apos;t want to miss. Of course, any weekend this summer would not be complete without a trip to the Danville Farmers Market. This week is the last Danville Farmers Market of the year, so be sure to head over to Danville Courthouse Square from 8 a.m.-1 p.m. for some fresh produce, baked goods and handcrafted items. Check out our Events Calendar for more information on these and other upcoming events in Hendricks County. Have a fantastic, long weekend!